Donald Trump made his first television appearance as president-elect Nov. 13, 2016, on 60 Minutes. A kinder, softer, gentler Donald Trump made his first television appearance since becoming president-elect. 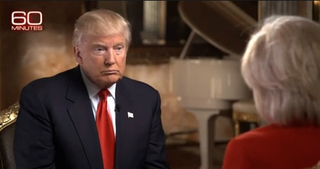 Appearing on 60 Minutes, Trump told host Lesley Stahl that he didn't plan to take a salary while he was in office, that he doesn't want the nation to be ripped apart and that he wants his voters to stop harassing minorities. It was a unique response from Trump considering that he ran his campaign full of divisive rhetoric aimed at everyone who wasn't a white man. Since winning the election, Trump seems to have completely switched his stance. He indicated that he believes himself to be a healer, an elected official who can work on repairing the divide that he didn't create but definitely expanded. Trump touched lightly on several different issues during the interview. He noted that he wanted to take a long look at the FBI and the release of information during the election. Since losing the election to Trump, Hillary Clinton has said that she blames FBI Director James Comey for her defeat. Eleven days before the election, Comey sent a letter to Congress noting that a separate investigation had unearthed many emails pertaining to Clinton's email scandal, a case that the FBI had closed in June. When asked flatly what were his plans for Comey, Trump told Stahl: "I think that I would rather not comment on that yet. I haven't made up my mind. I respect him a lot. I respect the FBI a lot. … There's been a lot of leaking, there's no question about that. But I would certainly like to talk to him." Trump did add that Comey's future with the bureau was not guaranteed. "I'd want to see, you know, he may have had very good reasons for doing what he did," Trump said. Trump also said that he had no intention of overturning gay marriage, but added that he would appoint judges who opposed abortion. If the Supreme Court overturned Roe v. Wade, the case that made abortion legal nationwide, then states would decide whether abortion was legal within their borders. And what was Trump's suggestion for women in states where abortion was declared illegal? "They'll have to go to another state," Trump said. Trump added: "We'll see what happens. It's got a long way to go, just so you understand. That has a long, long way to go." In all, Trump said that he would not take the $400,000 annual salary paid to presidents during their tenure. He said that by law he is required to take $1, which is what he planned to take. And what about the Trump brand? "Who cares? Who cares? This is big-league stuff. … We're going to save our country. I don't care about hotel occupancy," Trump said. "It's peanuts compared to what we're doing."